The warm mild Autumn has been a blessing and a bonus for you, the golfer. However, the mild damp and occasionally foggy mornings, have not been quite so welcome by us Greenkeepers. The current weather conditions are perfect for disease growth. 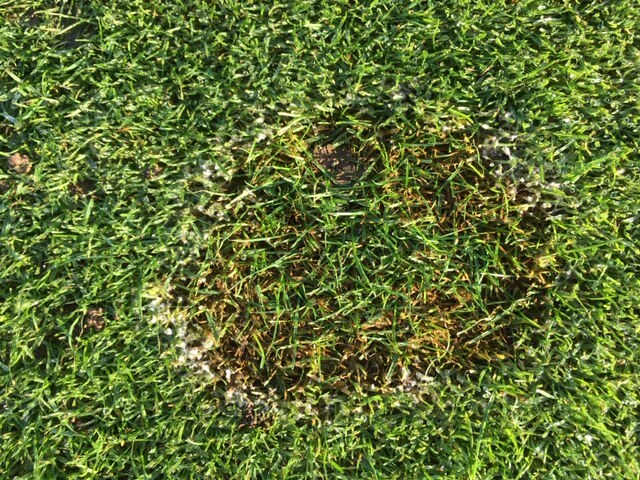 Fusarium thrives under these conditions. The picture below, shows perfectly the growing mycelium spores, being very active on a damp morning. Therefore, the forecast for the weekend is very welcome for us. An icy blow coming in from the north, will keep the grass leaf dry and the temperature down, which in turn will inhibit the growth of the disease. Many chemical products have now been withdrawn from the market, therefore making our job more challenging with the use of cultural and natural assistance, all the more important and has to be the way forward.